Didn't update in a week, was having mood swings during the weekdays followed by a busy schedule over the weekends, gomen -.-". I still get back some of those depression moods once a while, though the last serious one, which lasted 3 days, was back in BMT after watching Hantsuki, and at the same time depressing about half of my friends in camp too. The weekend was mainly spent outdoors, revisions for my driving test which was yesterday, and then going out with friends. Yes yesterday I had my Traffic Police Class 3 Driving Test @ SSDCL, first time taker.... AND I GOT MY LICENSE WOOT!! Scored a total of 12 demerit points, and out of my group of 10, only 2 passed. I now can drive legally!! In fact the passing rate is actually very low, in which from my observation of other groups, only about 1-3 per group will pass sadly. It's also ain't cheap to learn driving now, and having to book more revision lessons and another driving test will cost you about another S$300 more. I'm not sure if I really learn that fast (a few instructors were saying so), in which I had 18 practical lessons, and 3 revisions before the test, I wonder how many lessons did the rest do before theirs? Yesterday was also spent putting up more posters in my room, to only realise I didn't have enough tacks to stick them all up. Will need to get more. So until I finish doing up the room (I intend to do so before Chinese New Year), the pictures of it will have to wait. My Louise Bustier Ver. figure also arrived yesterday, and is now happily standing together with the rest of my figures. Will also do a photo shoot for them eventually. As for the remaining posts of the Japan trip... Will be putting them up tomorrow and the day after (2 days special!! ), as I intend to finish up on the "Japan Trip Series" by the end of this month, so I can go back to normal blogging/reviews. I think I'll need to set up multiple Flickr accounts as the free accounts can only display 200 photos, so I expect I'll need about another 4 accounts. Anyone knows of any better free photo hosting services please feel free to tell me about it ^^. I'm also doing some minor changes here and there to the blog, currently stuck on how to do the html coding for putting up a picture/banner and link it to another website. 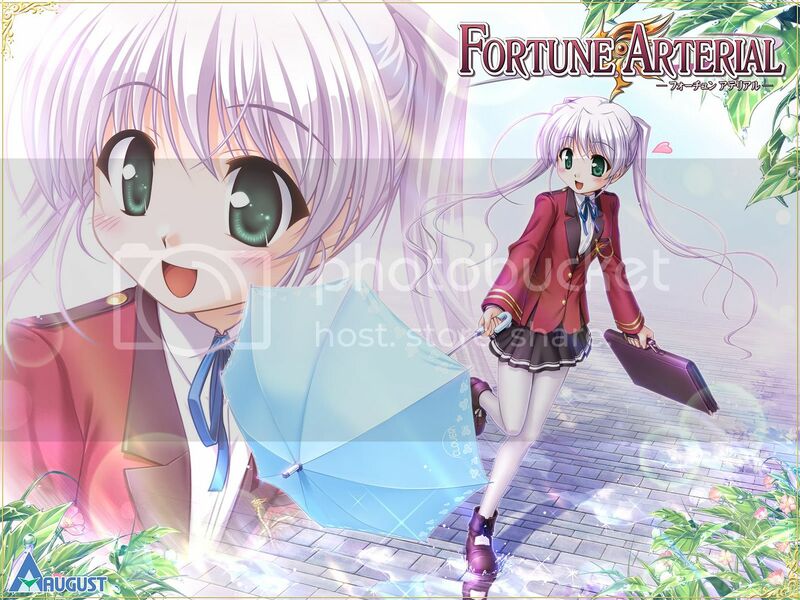 Time for me to go back to playing Fortune Arterial (Shiro is too cute!! ), and sort out the pictures of the Japan Trip at the same time. Here's some wallpapers of her too (1600 x 1200) in jpeg, but original is in bitmap though, but had to make the file size smaller for uploading. Enjoy and Signing out.